Farming is growing crops or keeping animals by people for food and raw materials. Farming is a part of agriculture. Agriculture started thousands of years ago, but no one knows for sure how old it is. The development of farming gave rise to the Neolithic Revolution whereby people gave up nomadic hunting and became settlers in what became cities. 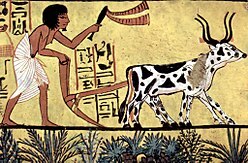 Agriculture and domestication probably started in the Fertile Crescent (the Nile Valley, The Levant and Mesopotamia). The area called Fertile Crescent is now in the countries of Iraq, Syria, Turkey, Jordan, Lebanon, Israel, and Egypt. Wheat and barley are some of the first crops people grew. People probably started agriculture slowly by planting a few crops, but still gathered many foods from the wild. People may have started farming because the weather and soil began to change. Farming can feed many more people than hunter-gatherers can feed on the same amount of land. Agriculture is not only growing food for people and animals, but also growing other things like flowers and nursery plants, manure or dung, animal hides (skins or furs), leather, animals, fungi, fibers (cotton, wool, hemp, and flax), biofuels , and drugs (biopharmaceuticals, marijuana, opium). Many people still live by subsistence agriculture, on a small farm. They can only grow enough food to feed the farmer, his family, and his animals. The yield is the amount of food grown on a given amount of land, and it is often low. This is because subsistence farmers are generally less educated, and they have less money to buy equipment. Drought and other problems sometimes cause famines. Where yields are low, deforestation can provide new land to grow more food. This provides more nutrition for the farmer's family, but can be bad for the country and the surrounding environment over many years. In rich countries, farms are often fewer and larger. During the 20th century they have become more productive because farmers are able to grow better varieties of plants, use more fertilizer, use more water, and more easily control weeds and pests. Many farms also use machines, so fewer people can farm more land. There are fewer farmers in rich countries, but the farmers are able to grow more. This kind of intensive agriculture comes with its own set of problems. Farmers use a lot of chemical fertilizers, pesticides (chemicals that kill bugs), and herbicides (chemicals that kill weeds). These chemicals can pollute the soil or the water. They can also create bugs and weeds that are more resistant to the chemicals, causing outbreaks of these pests. The soil can be damaged by erosion (blowing or washing away), salt buildup, or loss of structure. Irrigation (adding water from rivers) can pollute water and lower the water table. These problems have all got solutions, and modern young farmers usually have a good technical education. Farmers select plants with better yield, taste, and nutritional value. They also choose plants that can survive plant disease and drought, and are easier to harvest. Centuries of artificial selection and breeding have had enormous effects on the characteristics of crop plants. The crops produce better yield with other techniques (use of fertilizers, chemical pest control, irrigation). Some companies have been searching for new plants in poor countries, and genetically modify these plants to improve them. They then try to patent the seeds and sell them back to the poor countries. New plants were created with genetic engineering. One example of genetic engineering is modifying a plant to resist a herbicide. It is important for there to be enough food for everyone. The food must also be safe and good. People say it is not always safe, because it contains some chemicals. Other people say intensive agriculture is damaging the environment. For this reason, there are several types of agriculture. Traditional agriculture is mostly done in poor countries. Intensive agriculture is mostly done in countries with more money. It uses pesticides, machinery, chemical fertilizers. Organic farming is using only natural products such as compost and green manure. Integrated farming is using local resources, and trying to use the waste from one process as a resource in another process. Agricultural policy focuses on the goals and methods of agricultural production. Common goals of policy include the quality, amount, and safety of food. The major crops produced in the world in 2002, are maize (corn), wheat, rice, and cotton. Wikimedia Commons has media related to Farming.